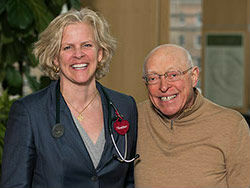 Al Dickstein is now soaring towards his 75th birthday, his health and spirit buoyed by his hero, Dr. Heather Ross, Medical Director at the Peter Munk Cardiac Centre’s Heart Transplant Program. Indeed, he likens his relationship with his doctor to one of his favourite songs by Bette Midler, “You know that line ‘You are the wind beneath my wings’? That’s how I feel about Dr. Ross,” explains Al. You can listen to Al’s story below.